ABC News Reports D.B. 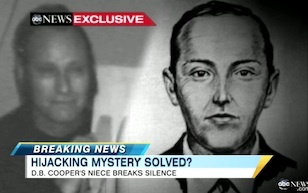 Cooper Exclusive: Has Niece Provide Key Evidence Solving Mystery? Lost in a sea of debt ceiling sturm and drang is another news story that has been overlooked by many in the press, a potentially resolved mystery that has captivated the nation’s attention and has even been the focus of a feature film in the earlys’80s. It’s the story of D.B. Cooper, the alleged skyjacker of a commercial flight in the early 70s, who has been a legend of mythic proportions and, thus far, an unsolved case. Until now, perhaps, thanks to a Marla Cooper, who is the niece of Lynn Doyle Cooper, who she believes is the real D.B. Cooper. A woman claiming to be the niece of infamous skyjacker D.B. Cooper has spoken to ABC News in an exclusive interview about her role in the recently re-ignited 40-year-old cold case that has haunted the FBI for years. Marla Cooper told ABC News that she has provided the FBI with a guitar strap and a Christmas photo of a man pictured with the same strap who she says is her uncle, Lynn Doyle Cooper. After clarifying her childhood memories surrounding the incident and more recent conversations with her parents, she is now sure that her uncle is in fact the notorious man who hijacked and threatened to blow up a commercial plane flying to Seattle in 1971, then parachuted to the ground with $200,000 in hand. “I’m certain he was my uncle, Lynn Doyle Cooper. Who we called L.D. Cooper,” she told ABC News. The story that she tells is compelling, though (SPOILER ALERT) the man that she believes was the known as D.B. Cooper died in 1999.